How Much Is Parking at the Austin Airport? As you might expect, the early birds tend to find the best parking deals at the Austin airport and at off-site lots. The main airport parking garage, which is within walking distance of the terminal, charges $23 per day. For partial-day parking, it’s only $3 per hour. The next-closest option is uncovered parking in Lot A, which goes for $11 per day. Lot A is about a five-minute walk from the terminal, but keep in mind that you might move considerably slower if you’re carrying several bags. Lots B through J are a little bit farther from the terminal, but a free shuttle circulates throughout the lots night and day. For less cost-conscious travelers, a valet is available on the upper level for those who will be away for at least 24 hours. The cost is $18. Ask for Premium Valet Parking ($27) if you want your car cleaned during your travels. Park & Zoom is the newest parking option, launched in November 2016. Although it is technically on the airport grounds, it's far enough from the terminal that you'll need to take a shuttle. Covered parking starts at $9.95 per day, and the company offers other services such as car washes and oil changes. You can’t miss the Parking Spot lot just off of Highway 71 because of all the spotted signs and spotted vans pulling out of it. Covered parking is $10.50 per day, but discounts are often available if you book online. Shuttles to the airport run every five to seven minutes, and the drive is usually only around five minutes except during rush hour. FastPark & Relax, located on the north side of Highway 71, offers an everyday rate of $8.73 per day. All parking is covered. Make sure you allow a little more time to get to the airport, however. It’s located a little more than a mile away at 2300 Spirit of Texas Drive. Regular customers praise their quick check-ins and fast shuttle service. They also provide free newspapers and luggage assistance. 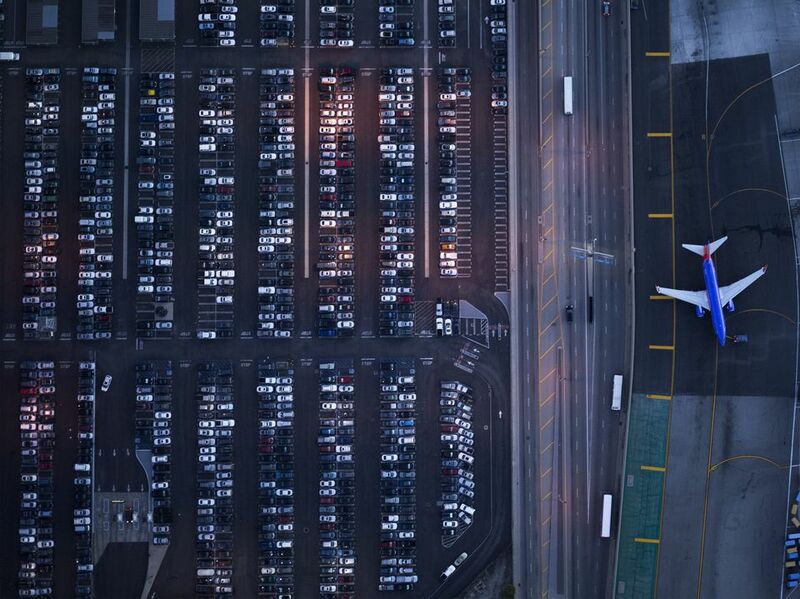 Global Airport Parking offers a novel approach. Instead of operating its own parking lots, the company rents out space at hotel parking lots in the area. Two participating Austin hotels are only about a mile from the airport: Holiday Inn Express and Quality Inn. Rates start at as low as $4 per day. Of course, availability and prices can vary widely, particularly during major Austin events such as South by Southwest, Austin City Limits Music Festival and the Circuit of the America’s Grand Prix. Advance online reservations are required. The shuttle service is provided by each hotel, not directly by Global Airport Parking. You will need a printed confirmation from the website to gain admission to the airport shuttle. You do not, however, have to stay at the hotel to use their parking lot via this service. Security for your car is also provided by the participating hotel. This option can be a great money saver if you have a little more flexibility in your schedule. The new South Terminal opened in April 2017, but it’s not simply an extension of the main terminal. It’s in a completely separate building farther south on the airport grounds. To access parking for the terminal, you must head south on Highway 183, take a left on Burleson Road and then another left on Emma Browning Avenue. You can either walk to the terminal or take one of the frequently circulating free shuttle buses. Long-term parking in this lot is $16 per day; short-term parking is $8 per day. Note that the lot does not accept cash; you must swipe a credit card to exit the parking area. The new southern terminal has led to a construction boom on the south side of the airport. Expect several new parking facilities by summer 2019.